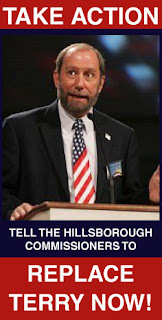 Just 24 hours after Equality Florida called for the replacement of notoriously anti-gay activist Terry Kemple from a board tasked with supporting equality, more than 700 people have contacted the Hillsborough County Commission demanding action. By a 5-2 vote, Kemple was appointed to the Human Relations Board whose purpose is to, "encourage equality among all people." Click here to send your own letter to commissioners. "People are speaking up because they are outraged by the appointment of someone who opposes equality, the very thing this board is supposed to represent," said Nadine Smith, executive director for Equality Florida. Kemple has consistently opposed equal protection under the law for gay people and has advocated against the freedoms of those who don't share his particular religious views. For years, he worked to block anti-bullying and non-discrimination protections in local schools. He tried to block students from forming Gay Straight Alliances on campus to reduce harassment and bullying of LGBT students. More recently, Kemple led a failed 2009 boycott against Pepsico because the company's provides equal benefits for gay employees. In his unsuccessful run for the Hillsborough County School Board, Kemple required donors to check a box declaring they do not support equal rights for gay people. "Terry Kemple's presence on the Hillsborough County Human Relations Board creates an insurmountable obstacle to the fulfillment of it's stated purpose - encouraging equality among all people - and we strongly urge the commissioners to replace him with someone who believes in the state mission of the Board." Commissioners Kevin Beckner and Les Miller opposed Kemple's appointment, while Commissioners Al Higginbotham, Ken Hagan, Mark Sharpe, Sandy Murman and Victor Crist supported his selection.